DoubleLine CEO Jeffrey Gundlach puts the odds of an interest rate hike before the end of the year at less than 50%. 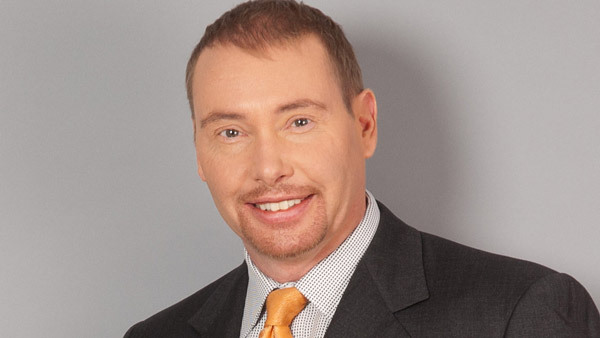 Gundlach shares his fixed income and market views each quarter. DoubleLine CEO and bond guru Jeffrey Gundlach said Tuesday that he sees the chance of a hike in interest rates less than 30% for September and under 50% for December. The bond market, according to data, “weirdly” believes the odds of a hike this year have risen, Gundlach says, but he does not agree. “I would take the under on that … I think the odds of raising rates by December is less than 50%,” he explained during a quarterly webinar. “The Fed’s willingness to increase interest rates has diminished,” Gundlach said. During the webcast, the fixed-income expert showed analysis of Bloomberg data through Monday. The figures show that the bond market sees the likelihood of a rate hike at 0% for June, about 29% for September and 58% for December. These figures jump to 64% in January 2016 and 91% in June 2016. A survey of 125 financial advisors released early Wednesday by SEI finds that 53% of financial advisors anticipate a rate hike by year end. The survey also shows that 50% of advisors polled believe a hike will lead to a market downturn, and 78% expect the Dow Jones to return less than 10% in 2015. According to market figures shared by NAREIT on Wednesday, the Dow Jones industrial average is down 0.3% so far in 2015, while the S&P 500 is up nearly 2%. The Russell 2000 has improved close to 4.3%, while the Nasdaq’s growth stands at almost 6%. Gundlach sees interest rates ending the year roughly where they began 2015: 2.20% to 2.25%. “People bailing on bond funds at 2.45% will probably end up buying them back at lower yields,” he explained. Still, “Get very scared if the 10-year accelerates above 2.6%,” Gundlach warned. Meanwhile in Europe, it’s been a wild ride. The 10-year German bond yield neared negative territory about two months ago, but it recently topped 1%. “A lot of fools bought German bonds at yields in the single digits for the 10-year, thinking somehow they would go negative. That hasn’t worked out,” Gundlach said. As for high-yield bonds, “I am not predicting a collapse of the high-yield bond market in 2015,” he stressed. What Do Gundlach and Goldman Really Think of Advisors?